Over the 2013-14 school year, the Health Design Lab (HDL) partnered with Vancouver-based Peregrine Plastics, a custom designer and fabricator of displays, furniture, and architectural features for leading Canadian companies. To encourage the cultivation of fresh, healthy food in densely populated urban areas, the HDL and Peregrine set out to design and prototype an urban greenhouse system. Like many cities, Vancouver is becoming an increasingly vertical environment. With this lack of space, people have lost the ability and luxury to grow fresh produce in their own garden. The goal of the project was to design a garden box that is highly versatile yet elegant and modern. A survey of existing greenhouses revealed products that were limited by scale or affordability. In order to be successful, the greenhouse would need to be flexible in growing space, be able to scale modularly, and be manufactured for less than $1000. Students rapidly ideated and tested concepts by sketching prototypes and building scale models of the greenhouse. The concepts aimed to capture the positive visual and material qualities of the plastic to create greenhouses that were not just highly functional but also emotionally and visually pleasing. 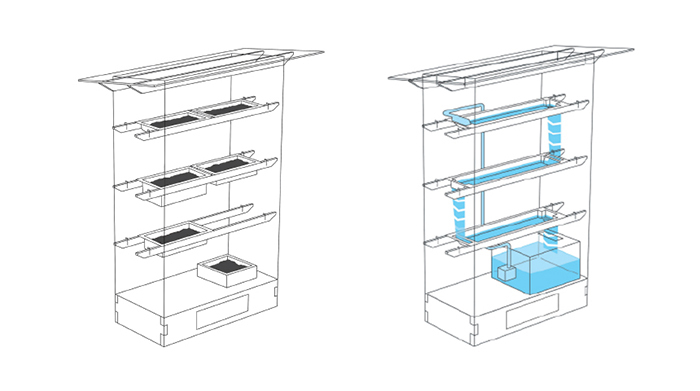 The system is appropriate for small outdoor spaces adjoining condominiums or small homes or for indoor use, and will extend the plant and food growing season of our West Coast climate. 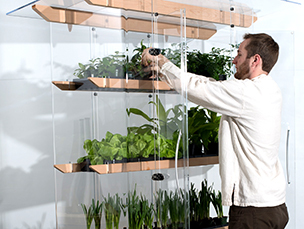 A range of growing techniques is facilitated to enhance the health and quantity of plants produced and also the ease and pleasure of gardening with this system. While there are many excellent food projects happening in Vancouver, not enough opportunities to share knowledge and build connections with the wider community exist. Along with the greenhouse, a possible action is to create a directory of key local food initiatives as well as annual events that support and celebrate local food. *Peregrine is always looking for industrial designers that have a passion for designing and building things. Please email Brian French at bfrench@peregrineplastics.com if you are interested in learning more about potential career opportunities with Peregrine.